Heavy Duty Disinfectant for the Control of Coccidiosis and Cryptosporidium. 1. Most effective disinfectant for occyst destruction for the control of coccidosis and cryptosporidium. 2. Certified general farm disinfectant and effective against Fowl Pest diseases and Swine Vesicular disease. 3. On the Department of Agriculture’s list of approved disinfectants. 4. Performs on Cattle, Sheep, Pig and Poultry farms. 5. Application Rates:Recommend dilution rate of 2-3% w/v in use for specific coccidial challenge. For a severe coccidial outbreak, a dilution rate of 4% is recommended. Apply mixture at 300ml per square metre. Ensure all surfaces are thoroughly wetted. Use a dilution rate of 2% w/v for foot dip baths and change when heavily soiled with organic matter or on a weekly basis. Recommend dilution rate of 25% with termal fogging and apply at 12ml per square metre. 7. Applied by spraying, foaming, thermal fogging or for use in footbaths. 8. Available in 25lt & 5lt containers. 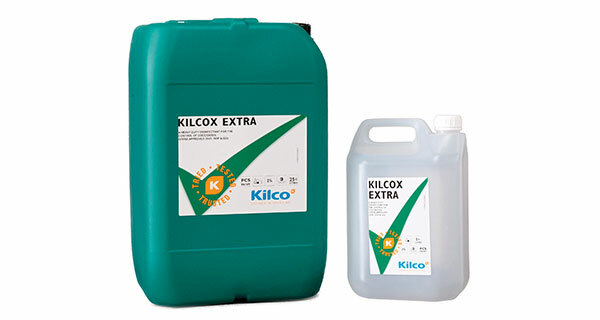 To download KILCOX EXTRA product information, click here.